Richard M. Terek, MD, FACS has been awarded a $1.4 million research grant from the National Cancer Institute of the National Institutes of Health to study bone cancer. The research will be focused on mechanisms to develop new therapies and strategies to prevent metastasis of chondrosarcoma based on microRNA and nanotechnology. The grant is an R01 grant, the original and oldest grant mechanism used by the National Institutes of Health. “R01 grants from the National Institutes of Health are highly competitive, and there are very few orthopaedic surgeon – scientists who are successful at competing for these grants” says Terek. “The research environment and collaborators in the Orthopaedic Research Laboratories, built and expanded over the years by philanthropy, prior grants, and the department, all contribute to the success of our research program, says Dr. Michael Ehrlich, Chairman of the Department of Orthopaedic Surgery at the Warren Alpert Medical School of Brown University and CEO of University Orthopediccs, Inc.
Chondrosarcoma is a primary bone tumor that primarily affects adults. Unlike other primary bone sarcomas such as osteosarcoma and Ewing sarcoma, chondrosarcoma prognosis is not improved with chemotherapy. Therefore, understanding the biology of the disease may allow for the development of targeted therapy so that tumor growth and metastasis can be inhibited. Nanotechnology is being developed to target biologic agents to tumors. Terek was recruited to Rhode Island Hospital in 1993 to launch the development of musculoskeletal oncology services. 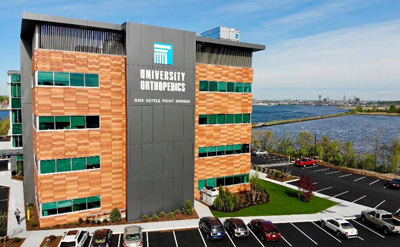 Working with medical and radiation oncologists, adult and pediatric patients with bone and soft tissue tumors as well as metastatic bone disease now have the complete spectrum of treatments including limb salvage and reconstructive options available here in RI and no longer need to travel out of state.